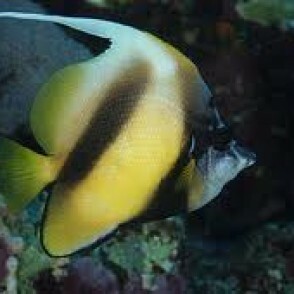 The Heniochus Black & White Butterflyfish, also known as Longfin Bannerfish, has a very elongated white dorsal filament. 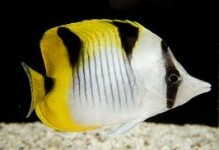 It has a base color of white with two wide black stripes. 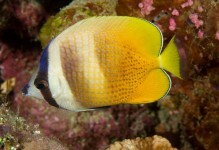 The soft dorsal and caudal fins are yellow, and there are black marks above the eyes. 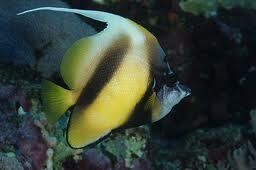 Members of theHeniochus genera are often called Bannerfish instead of Butterflyfish. 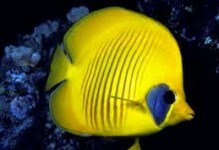 The Heniochus Black & White Butterflyfish may reside in a 125 gallon or larger aquarium with other peaceful fish and others of the same species, if all were introduced into the tank at the same time. 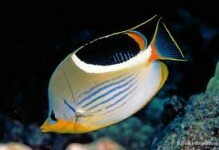 When swimming, the elongated white dorsal filament moves like a banner in the wind.